When he's not spitting out rhymes, smoking something "strong," or talking about how badass otters are (he calls 'em mongooses), Snoop Dogg is probably somewhere wielding a lightsaber, living a double life as a Jedi. "Wait, are you guys still hung-over from watching Star Wars Episode VII: The Force Awakens?" you might be asking yourself. Yeah, probably. 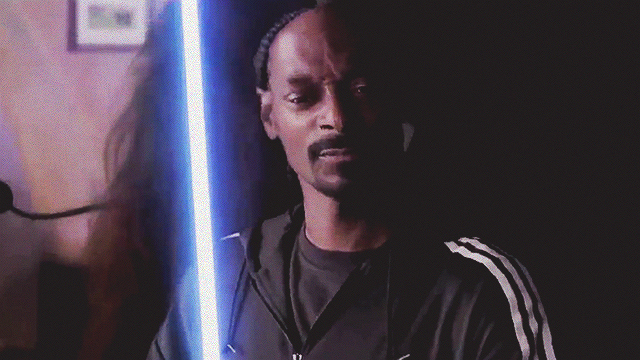 But you really can't blame us after watching a clip showing just that: Snoop Dogg as a friggin' Jedi. Also, if you watched the whole thing (we did, like five times), you'll see other big time celebs in the video, from football superstar David Beckham to Oasis' Noel Gallagher. To clarify though, the video was actually an adidas ad released back in 2010 for the 2010 FIFA World Cup. However, it was sort of "resurrected" recently by Montreality (a YouTube account that specializes in doing hip hop interviews) and now has garnered almost 7,000,000 views, over 83,000 shares, and over 7,000 likes on their Facebook page. Makes you think what Mr. Fo' Shizzle is up to next, doesn't it?